When I wrote my first book about MirrorWorld I thought it would be one journey. I should have known better! I thought the same about Inkworld – to find myself still writing that story six years later. To realize that these two worlds are indeed the same, just 500 years apart, bound by a book with silver covers, took me a few years too. Which teaches one thing: stories don’t reveal their secrets easily. They are labyrinths that lure us in with a whisper to then distract and fool us, to lie and trap the writer who tries to find their heart. And the better we get in our craft the bigger the labyrinth grows! When I wrote Book 1 – Reckless, as it is called in the US (I’ll soon re‐publish it under the original title Reckless: The Petrified Flesh) I was still on familiar ground. I wrote about a world inspired by the tales of my German childhood. Most of us associate the Grimms’ tales when we hear ‘Fairy Tale’. I decided to play with their motives in a world closely resembling ours around 1860, a time, when the modern times were born, with no chance of going back. But how would it change the world if there is old and new magic (as they call science behind the Mirrors)? What if all Fairy Tales were historical truth, preserving a long forgotten past? The next step was to take the local origins of the tales seriously. No trolls outside Scandinavia, except emigrants. What are Heinzelmen called in France? Follets. And Hobs in Albion. You see? I was lost behind the Mirrors as soon as I stepped through them! 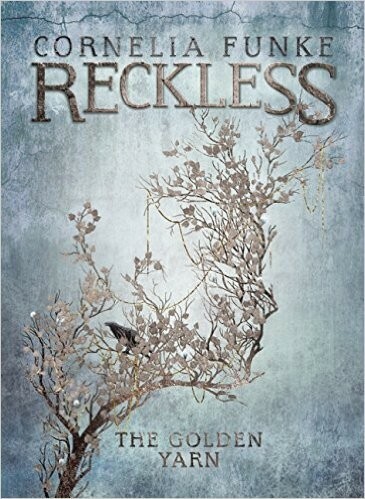 The second book – Fearless in the US, Reckless: Living Shadows in most other countries – brought me to France. Where I met Bluebeards and learned a few things about giants, mal de mer and puss in boots. Those tales are still quite familiar to us, but the Golden Yarn‐ my third journey behind the Mirrors – led to lesser known tales. My heroes head East, to find creatures and treasures from Russian and Ukrainian tales, from Siberia and Kazakhstan. The tales I discovered for this book were mostly not familiar. They tasted of far away landscapes, of a Shaman tradition almost forgotten, they had powerful women characters in them, who probably once were goddesses…. The Golden Yarn is my most exciting adventure behind the Mirrors so far. But the next one is taking shape already in equally exciting ways. I am currently reading fairy tales from Japan and India, which make me feel as if I know nothing about this world! I plan to travel to the Americas in Book 5 and to Africa in Book 6, but let’s see. Only the story knows where this will go. It enchants me with every step I take and every tale I read. It feels like exactly the right journey in a time when we realize every day how little we know about each other and how dangerous this ignorance and lack of understanding is. About: Jacob Reckless continues to travel the portal in his father's abandoned study. His name has continued to be famous on the other side of the mirror, as a finder of enchanted items and buried secrets. His family and friends, from his brother, Will to the shape-shifting vixen, Fox, are on a collision course as the two worlds become connected. Who is driving these two worlds together and why is he always a step ahead? This new force isn’t limiting its influence to just Jacob’s efforts – it has broadened the horizon within MirrorWorld. Jacob, Will and Fox travel east and into the Russian folklore, to the land of the Baba Yaga, pursued by a new type of being that knows our world all too well. One winner will receive a copy of The Golden Yarn, US only. Entering is simple, just fill out the entry form below. During this giveaway, Cornelia Funke has a question for you to answer in the comments below for more chances to win his book! What folklore inspired the writing of this latest book in the MirrorWorld series? Cornelia Funke is a multiple award-winning German author, best known for writing the Inkworld trilogy as well as The Thief Lord. The Inkworld books, which have won the 2003 Mildred L. Batchelder Award as well as the 2004 and 2006 BookSense Book of the Year Children's Literature Awards, have gained incredible attention and Funke has been dubbed the "German J.K. Rowling” This November, she will launch her own publishing company, Breathing Books. She lives in Los Angeles, California. The folklore that inspired book three originated in Russian and Ukrainian tales with stories of Baba Yaga. The folklore was based off of Baba Yaga! Baba Yaga inspired this latest book in the MirrorWorld series. Russian and Ukrainian tales sparked this story. Fascinating!